We are heading towards an abundant society where quality education and healthcare are accessible through mobile devices. How do we ensure that all of us will be able to enjoy such benefits? We are heading towards what we might call an abundant society but do not have the social tools to ensure that it will benefit us all in issues that really matter. We need open systems and an open-source mindset to tap the potential of this approaching era of abundance. What is an abundant society? We already live in a society abundant with information. In 2017, more than 2.5 billion people have a smartphone, a figure likely to top 5 billion in 2020. This means that more than half the world’s population will have a supercomputer in their pocket with potential access to high-quality education and world-class healthcare. Before 2030, every child on the planet will have the tools to learn literacy, mathematics, life skills and critical thinking. If we take this likely scenario as a starting point, we should be able to use the world’s information networks to formulate a giant plan and to-do list. What could this plan look like? According to Diamandis and Kotler, we are on our way towards “a world of nine billion people with clean water, nutritious food, affordable housing, personalized education, top-tier medical care, and non-polluting, ubiquitous energy”. Abundance comes in the form of distributed systems where everyone has access to resources without limiting anyone else’s access. It resembles the World Wide Web: networked and detailed, big and overwhelming. Connections and relations are the glue that binds things together and makes sense of the abundance. Abundance will eventually change configurations of global value and production chains. 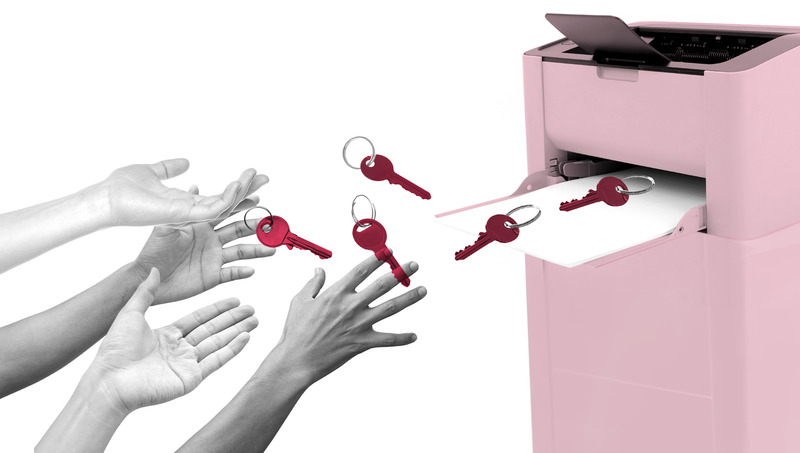 More production will be local and instead of sending physical items we will send product IDs. …we can move a physical object, a toy, from one coast to another by simply pass its name. Returning the toy to the store on the east coast and buying a corresponding toy on the west results in the very same toy appearing on the west coast. The question is not whether it is indeed the same toy but rather what a mean by “same”. This ability to take an operational view of meaning is a by-product of the articular understanding wrought by software. Today we use e-commerce for sending physical items; tomorrow 3D printing will do the job easier and faster for a lot of things. For example, making choices will increasingly become a burden, we will have too many choices and will have to deal with a lot more decisions than before. Findability will make the right resources available at the right time. Artificial intelligence, AI, will most likely help us with this, it will help us make decisions, browse data and select the most efficient solutions. Business models will have to enable us to make use of this abundance, to complement and support abundant resources. Many tools will be freely available which increase the need for things like training, support services and tailoring. Linux and open-source software has already put this software market on the map and companies like IBM have had to adapt. The abundant society will happen mainly because abundance in one area begets abundance in another. Abundant phenomena are interconnected and feed off each other. The speed with which things are changing, contributing to abundance, is increasing and that makes seemingly wild predictions more likely to occur than most people think. On this small planet, our grand challenges are not isolated concerns. Rather, they are stacked up like rows of dominoes. If we topple one domino, by meeting one challenge, plenty of others will follow suit. The results are a feedback loop of positive gain. Even better, the reverberations of this cascade stretch far beyond borders – which means that providing for basic physiological needs in developing countries also improves quality of life in the developed ones as well. Accessing the World Wide Web is one example that changes people’s lives profoundly. It accelerates people’s learning capabilities and co-operative efficiency. The Web is a cognitive lever that affects everything we do. Energy is another lever. For example, with abundant energy you can clean enormous amounts of water. And access to clean water stops population growth because parents know their children will survive and be able to provide for their parents. That way parents do not need to “insure” themselves with many children. Parents with two or three children tend to focus more on providing education and healthcare for their children. Also, children are no longer removed from school to gather the water and firewood needed to boil dirty water, and as a result education levels rise. Levelling access to quality education also increases equality between the sexes as well as the number of women with a working career. Bangladesh is a good example of this dynamic. Access to the Web has a similar compounding effect. Web users are connected to a network of other Web users, and the more users that become connected, the more information is available. When more information becomes available, more users are attracted to the Web, which in turn makes the abundance of information grow even further. And thus, abundance begets abundance. Energy provides the means to do work; education allows workers to specialize; information/communication abundance not only furthers specialization, it allow specialists to exchange specialties. 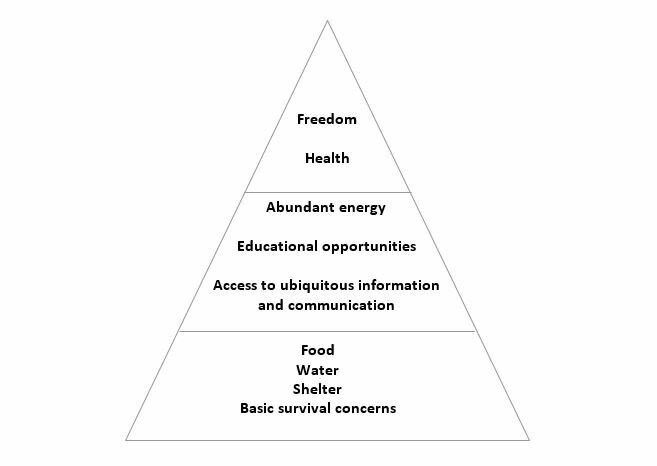 This abundance dynamic can be portrayed as a “Pyramid of Abundance”, similar to Maslow’s hierarchy of human needs but organised a bit differently. The following diagram is our interpretation of the Pyramid of Abundance by Diamandis and Kotler. The Pyramid of Abundance focuses on the individual experience and the qualities that enable us to live free and healthy lives. These are things that every human being can expect to access within three to four decades. How well adapted are we to an abundant society? We’re not! Well, we are. But not well enough. The Nordic countries have many of the right assets for an abundant society. They are small, relatively nimble and well connected. We have inclusive cultures where people are capable of moving through society, regardless of where they were born, giving people the opportunities required to enrich the abundance of information with their different perspectives. A more closed culture could function as an excluding force, reserving the intellectual space for those higher up in societal hierarchies. In a bigger picture, all human cultures have hierarchies which we need to unlearn and reshape. The non-hierarchical structures, however, do require other tools for gathering information, since we can no longer rely on the old structures to give us what we need. Coping with the new structures will require new intellectual tools. enables people to build on each other’s efforts. Methods like peer production and agile development offer a hint of what working life will be like. Companies, authorities and organisations should be encouraged to explore capabilities broadly and to create cultures of experimentation, organising and working in ways that support creativity. Distributed culture is about relations. Economies of greater scale do not hold as strongly as before, whereas smaller economies with great connections will have enormous leverage. With abundant resources, the connections become a lot more important. But to make relevant connections we need to structure our means, and to do that we need to use many different methods. Hierarchies are one of many possible ways to structure, to relate items to each other. In the hierarchical culture, scale is the defining attribute and large-scale efforts are usually more productive than small-scale efforts. And lastly, we do not yet have institutions and structures that support fast, small-scale, iterative learning production. The abundant society is a co-operative culture focused on relations, and our structures need to be more adaptive to accommodate the many relations that are becoming possible. Proprietary systems slow things down, belonging to a previous age where the internet was still just seen as a more advanced phone line between companies and people. In a non-hierarchical society where information needs to flow without restrictions and in any direction, systems need to talk to each other in the same way.